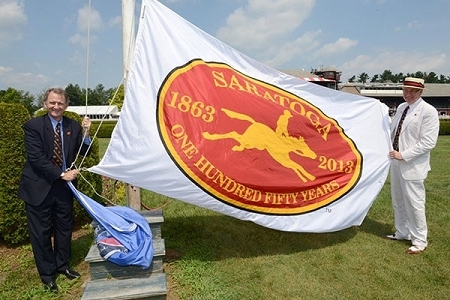 Saratoga Flag Company has been chosen to exclusively offer this limited edition "Historic" flag created for the 150th Anniversary of the Saratoga Racetrack in Saratoga Springs, New York. 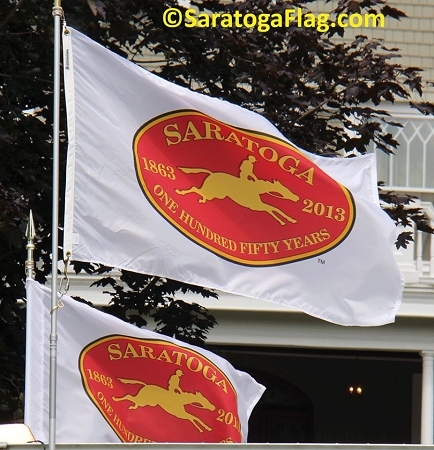 In celebration of the 150th Anniversary of Saratoga Race Course, we are extremely honored that Saratoga Flag has been selected as the exclusive flag maker to create the Saratoga150 flags and banners for the 2013 Festival. 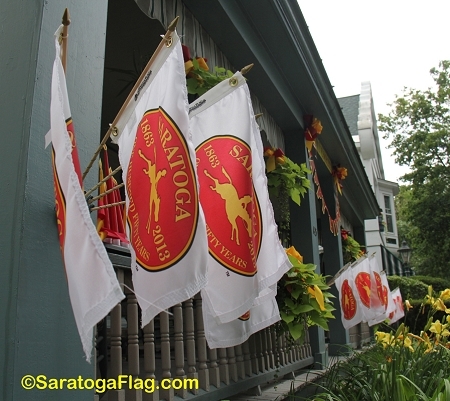 Show your support for Saratoga Racing and the local community.... fly the Official "Saratoga 150" flag on your home or business. 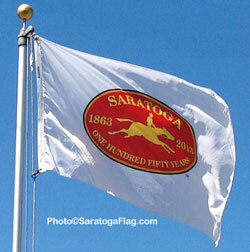 Makes a great gift for Horse Racing fans & Saratoga Visitors as well! 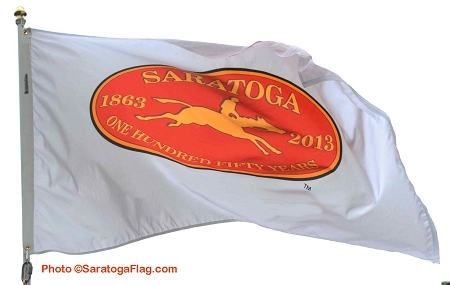 20% of all sales of the "Saratoga 150 Flags" will be donated by Saratoga Flag to the Saratoga 150 Sesquicentennial Organization. 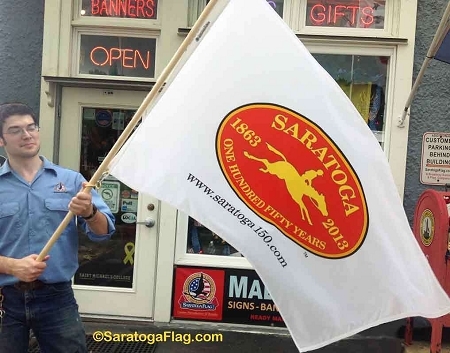 • 4inch x 6 inch hand-held flags (Fully dyed Printed Flag, mounted to 10inch black staff. 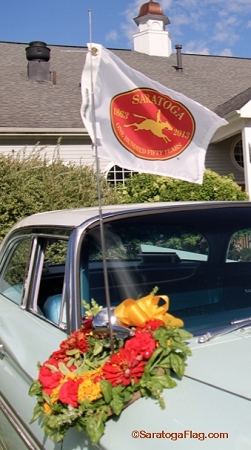 Great for Desk or table displays!). (Out of Stock). • 12inch x 18 inch with header & grommets (Fully dyed Printed Flag. Great for Boats!). (In-Stock). 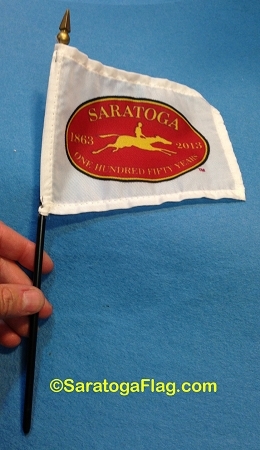 • 2.5ft x 4ft with pole sleeve (Fully dyed Printed Flag. 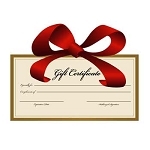 Great for Homeowners!). (In-Stock). 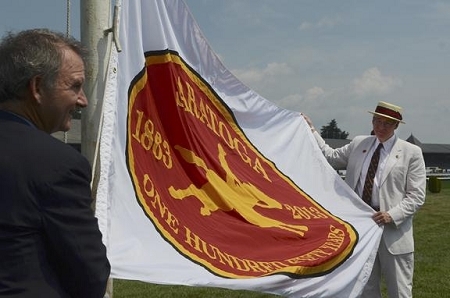 • 3x5ft with header & grommets (Fully dyed Printed Flag. 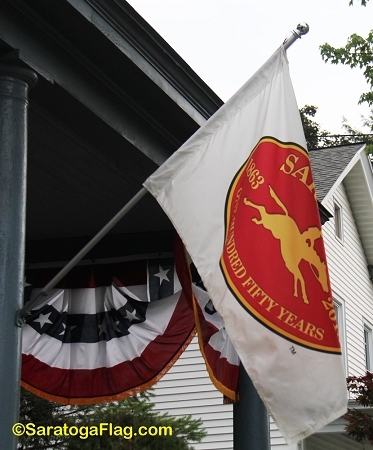 Great for flying on 5ft poles and larger in-ground flagpoles!). Our most popular size!(In-Stock). Logo is correct reading on one side & reverse on the back. This is a limited-run item.